New users: get 2019 and 2020 for $550.00 ! Each new year of Financial Planning Tools replaces the previous year's program, which changes to read-only mode after May 31st. CFS Financial Planning Tools uses the same interface as our popular TaxTools program, offering the same powerful integration of planning modules and client database, but geared towards the financial planner/advisor. Financial Planning Tools includes a comprehensive Financial Planner module as well as over 100 Forms, Worksheets, Flowcharts, and Calculators. Bar charts, graphs and pie charts can be printed in color. Imports clients and preparers from other CFS programs. Inflation factor built into worksheets and calculators. Tutorial guides the user through the many features. Includes sample client with data. Comprehensive Financial Planner module includes long-term cash flow projections, education funding analysis, life/disability/long-term care insurance needs, and estate tax liability and planning reports. 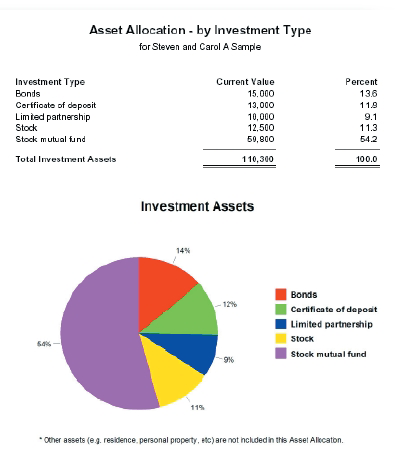 Prints presentation-style Personal Financial Plan (in color). Forms ADV-Part 1A and ADV-Part 1B with Schedules for filing financial disclosure reports with the SEC. Other easy-to-use modules, such as IRA - Minimum Distribution Payout Projection, Social Security - Take it at Age 62 or later, Comparison of Will & Living Trust, and Credit Card Reduction Planner, allow you to quickly answer your financial planning clients' questions. Various Investment & Loan Calculators are handy for quick loan amortization and future-value calculations. Useful document templates for financial planners, including Business Plan, Financial Planning Agreement, and Investment Advisor Client Contracts. IRA: Minimum Distribution Payout Proj. Form ADV - Part 2A, Apdx. 1, Wrap Fee Prog Broch. Temp. Inv: How Much do I Need to Save For Retirement? Inv: How Can You Reach Your Investment Goal? Inv: How Much Money Can You Save? Inv: How Much Must Your Initial Investment Be? Inv: How Much Must You Contribute Each Period? Inv: How Much Retirement Income Can I Expect? Inv: How Long Will It Take to Reach Your Goal? Inv: What Rate of Return Must You Achieve? Loan: Can You Afford This Loan? Loan: How Large Can Your Loan Be? Loan: How Much Will Your Loan Payment Be? Loan: How Long Will It Take to Pay Your Loan? Loan: How Will a Lump Sum Payment Reduce the Loan? Loan: What Is the Interest Rate on Your Loan? Loan: Comparison of 10, 15, 20, and 30 Year Mortgages? Loan: Which Mortgage is More Cost Effective?